Britain's Population addresses issues relating to the demographic characteristics of British society. Many of the contemporary features of the population relate to changes in the past - particularly the ups and downs in attitudes to marriage and family formation. The history of these trends is considered, including the 'baby boom' of the 1960s when three million children were added to the population within the space of ten years. Jackson argues that the impact of this bulge generation can still be identified and will become of increasing importance when thegeneration reaches retirement age. Current trends in fertility are influenced by the changing structure of the labour market and by the delay in marriage and child bearing to later life. The 1990s has been the era of the 'double income no kids yet' partners and the thirty-something mother. 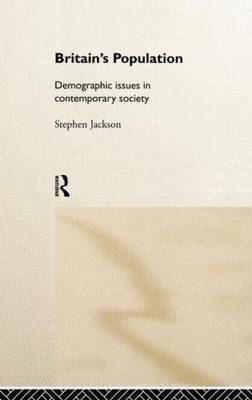 In this book Stephen Jackson highlights how the plight of single mothers, the problem of funding pensioners, and the future of the welfare state, all depend on demographic trends in society.